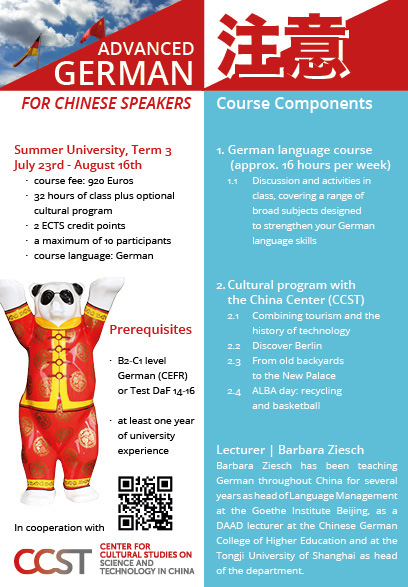 This is an advanced German language program being offered in collaboration with the Center for Cultural Studies on Science and Technology in China at the TU Berlin. This course is open only to native Chinese speakers with prior knowledge of German language, equivalent to the level of B2-C1 (CEFR) or Test DaF 14-16. The course language is German. Participate in Chinese-German exchange and intercultural meetings in the Center for Cultural Studies on Science and Technology in China. The course will be taught by an experienced lecturer in cooperation with the Center for Cultural Studies on Science and Technology in China. Please note that the course language will be German.